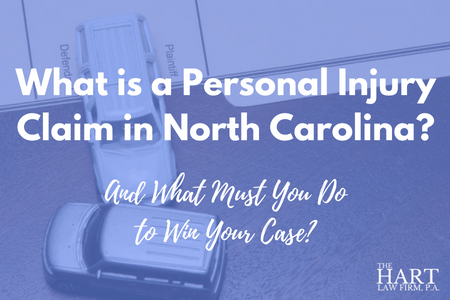 What Must You Prove to Win Your Personal Injury Claim in North Carolina? What is a Personal Injury Claim and What Must You Prove to Win Your Case? You may, and likely have, seen ads for “personal injury” lawyers and you are probably wondering what those lawyers do. It seems obvious to me because I went to law school, but to the average person, you may have no idea what a personal injury lawyer is. There are many different ways for a lawyer to say that they handle a personal injury case, including “auto accident lawyers”, “medical malpractice lawyers”, or “wrongful death lawyers”. But all of these phrases are just subsets of the much larger pool of personal injury lawyers. All of these terms are just fancy ways that lawyers can say that they help people who have been injured by someone else’s carelessness, stupidity, or both. In the case of an auto accident, another driver may have hit them. In a medical malpractice case, a doctor made a mistake that caused them harm. In a wrongful death action, someone died because of the careless or outright wreckless actions of another person or business. When we are dealing with an auto accident, there are actually two different types of claims that can be brought. If you were in a small “fender bender” and your car was dinged up but you weren’t hurt, then you wouldn’t have a claim for personal injuries, but you may have a claim for property damage to your car. If you were personally injured and your car was also damaged, then you would have a claim for both personal injuries and property damage. We don’t handle cases where the only damages were to your vehicle, but there are lots of attorneys that would, and we would be happy to provide you with a referral. In situations where your car was damaged, then either your insurance company or the insurance company of the person that hit you will pay for the damage to your car. If the careless actions of another person caused someone’s death, then you can bring a claim for “wrongful death”. The laws on this issue are complicated and vary by state. If you find yourself in the unfortunate situation of representing the estate of someone who died due to the negligence of someone else in North Carolina, then you should talk to North Carolina attorney about whether a wrongful death action should be brought. What Must You Prove to Win Your Case? If you are injured in North Carolina, you are facing an uphill battle from the beginning. The insurance lobby has deep pockets and has spent lots of money to convince politicians to pass laws that tip the balance of power in favor of corporate profits. This whole movement has gained lots of steam in the past few years and is called tort reform. If you want to get a better understanding of how the insurance company is trying to stack the deck in its favor, you should watch a documentary called “Hot Coffee” that details the lengths that the insurance companies will go to in their effort to deny justice to everyday Americans. Honestly, until you or someone you know was injured, what was your impression of lawyers that represented accident victims? In any event, if you have been injured due to the actions of someone else, it’s not enough to ask the insurance company to pay your damages. If the insurance company presents you with a low-ball offer or denies your claim entirely, your only recourse is to file a lawsuit against the person responsible for your injuries. When you go to court, you must not only prove that the other person or company was negligent, but you must also prove that their negligent act caused your damages and that you were not at fault in any way. (More on that in a minute). If you can’t prove that the other person was negligent… you lose. If you can’t prove that you weren’t partially to blame… you lose. If you sue the wrong person or company… you lose. If you wait until after the statute of limitations has run to file suit… you lose. 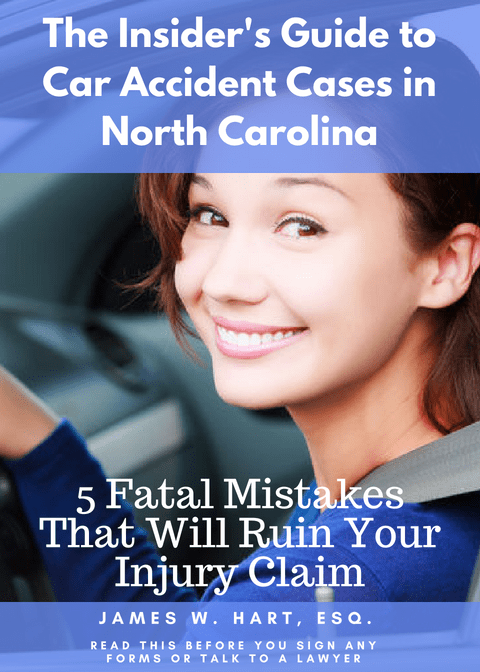 In North Carolina, if you were at anyway at fault for your accident… you lose. In North Carolina we have a rather harsh law (that’s probably an understatement) called “contributory negligence”. What contributory negligence says is that if you were even 1% at fault for the accident, and the other person was 99% at fault, you will still LOSE. And you know what? You are right. Who do we have to thank for this ridiculous law? The insurance companies that dreamed it up, and the state legislators that wrote and supported this law. North Carolina is one of only four states and the District of Columbia that keep this stupid rule on the books. Most states use what is called “comparative negligence” to apportion damages in proportion to the percentage that the plaintiff and defendant were at fault. So if you come to us and ask us to take your case, we must be absolutely certain that you weren’t at fault in any way for the accident, not even 1%. If you were, we can’t take your case. Generally speaking, there are three different phases of an accident claim in North Carolina. The first is the treatment phase, followed by pre-litigation negotiations and finally, filing a lawsuit and scheduling a trial. Let’s take these one at a time. During the treatment phase, you are tasked with one thing, and one thing only. You should be following the advice and recommendations of your doctor and trying to get better. Behind the scenes, we will be gathering information such as your medical records and history, work and paystub information, witness statements, police reports, and insurance information for the person who caused the accident. Once you have finished treating with your doctor and reached what is called “maximum medical improvement” or MMI, we will lay out a settlement strategy with you, including providing you with a very detailed and confidential written settlement evaluation for you. The whole point of this exercise for the lawyer and client to be on the same page in terms of what a reasonable settlement value is BEFORE settlement negotiations begin. Prior to filing suit, your lawyer will put together a comprehensive settlement demand package to send to the insurance company. Once you know what the insurance companies’ best offer is, you can decide whether or not it is acceptable to you. In some cases, it doesn’t make sense to engage in pre-suit negotiations. This happens when we are dealing with an insurance adjuster who is known to low-ball their settlement offers, and is just using the pre-suit period to gather as much information about you, your lawyer and your doctor as possible. Their end goal is to try to low-ball you or prepare for trial if you refuse their settlement offer. Some lawyers will wait until the statute of limitations has almost run out to file a lawsuit. In North Carolina, the statute of limitations is three years. We believe that waiting this long to file a lawsuit is not a good strategy. Not only do you run the risk of suing the wrong defendant and getting your case dismissed, but it also leads to general chaos, confusion and stress for the lawyer handling your case and you as an injured party. For that reason, we typically will not take cases where the statute of limitations is set to expire in less than 6 months. The final stage of the process is to file a lawsuit and schedule a trial. The most lengthy part of the lawsuit/trial process is called “discovery”. Discovery is where the defendant may ask you questions about the accident, and gather documents about your medical and work history. They may also choose to ask you questions under oath in a legal proceeding known as a deposition, or have you submit to an independent medical evaluation with a doctor of their choosing. You will also be permitted to ask written and oral questions of the defendant under oath. After discovery is completed, there may be various pre-trial motions filed and hearings scheduled, followed by a jury trial. One of the most complicated areas of the accident claims process doesn’t happen until after your case has been settled – and that is the potential reimbursement of medical bills that have been paid by your health insurance provider. The fancy term for this is “subrogation” and it is extremely complicated and easy to mess up. Here’s the thing – in North Carolina, and many other states, a private health insurer is prohibited from seeking reimbursement from an accident victim who recovers from the person who caused the injury. However, (surprise, surprise) that little “nuance” doesn’t keep the health insurance companies from seeking this reimbursement anyway. That’s because if the health insurance is covered by Federal ERISA law, then they can still seek reimbursement by filing an action in Federal court. The implications of this are straightforward – you must find an attorney who is able to review your health insurance policy and if necessary, negotiate the payment of these bills with the insurance company before allowing you to agree to a settlement. But those aren’t the only health-related pitfalls that you need to be aware of. If you have unpaid medical bills, those providers will be seeking payment as well in the form of a lien. However, for them to get paid they must have “perfected” their lien, which is a legal process that allows them to secure payment against your settlement. So even though you think that you will only be negotiating with the insurance companies for the at-fault driver and potentially your own insurance company, in actuality there may be multiple insurance companies and medical providers involved, all of whom want a piece of your settlement. If you aren’t careful, and don’t negotiate these liens and payments carefully, you could risk losing your entire settlement to medical providers and health insurance companies. A personal injury lawyer can help you to navigate this process. Click here for more information and resources, or if you have been injured in a car accident in North Carolina.